In December 2017, the world’s largest marine protected area (MPA) in the Ross Sea, Antarctica entered into force. The MPA will be in force for at least 35 years. A joint proposal by New Zealand and the United States (US), advanced through the Commission for the Conservation of Antarctic Marine Living Resources (CCAMLR), led to an agreement amongst the 24 state parties and the European Union (EU) after more than five years of negotiations. Established in May 1980, CCAMLR was created by Antarctic Treaty Consultative Parties (ATCPs) as a reaction to mounting concerns that fishing needed to be managed in the Southern Ocean, lest fish stocks become over-exploited and the Antarctic ecosystem degraded. For International Relations scholars, the Antarctic provides rich examples of how governance has evolved to address remote spaces such as Antarctica with no indigenous human population. The 1959 Antarctic Treaty and its associated legal instruments have underpinned a governance regime whereby certain rules, norms, values and expectations prevail. 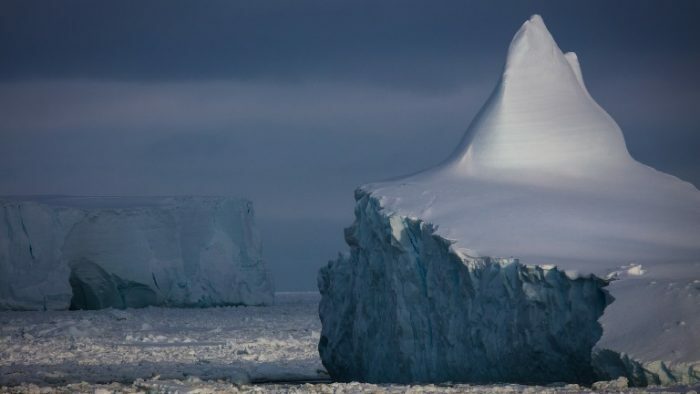 Signatories to the Antarctic Treaty including the US, Russia, China and seven claimant states including the United Kingdom (UK), Argentina, New Zealand and Australia, are expected to uphold the fundamental values of the Treaty. These include: the promotion of peace and co-operation; the pursuit of environmental protection; the conduct of science; the non-militarization of the Antarctic Treaty area (south of 60 degrees South); and to support additional provisions relating to resource management, in particular fishing. Antarctic geopolitics for us is a helpful term highlighting the contested status of these southerly territories, both continental and maritime. While the Antarctic Treaty System (ATS) remains integral to the governance of Antarctica, it is not without its fissures and schisms. Although consensus generally prevails, the history of the Ross Sea MPA reveals well that state parties can have very different and intersecting visions for Antarctica. ‘Saving, securing and sustaining’ capture something of this tension – as parties, claimant and non-claimant alike, manage a variety of imperatives including territorial and resource interests, environmental protection, scientific research, commercial opportunities and sovereign rights. These imperatives are spatially variable – fishing areas are often concentrated around islands in the Southern Ocean – and temporally sensitive, for example with the Ross Sea MPA constrained by a 35-year ‘sunset clause’. Southern Ocean fishing is shot through with these challenges and opportunities. Marine protected areas (MPAs) are a long-established feature of marine spatial planning. Initially conceived as a tool to manage and protect coastal fisheries and ecosystems, the term has evolved to cover a variety of interventions including marine refuges, research reserves, and eco-reserves for tourism. Within the realm of living resource management, MPAs can embrace a variety of practices ranging from very restrictive no-take areas to sustainable commercial fishing to recreational activity. In short, the term MPA encompasses considerable variety when it comes to the size and nature of the geographical area affected, the activities addressed and the objects that are to be conserved, managed and/or protected. And as a consequence, the scope and extent of legal protection and management strategies are not uniform. One noticeable trend is the implementation of what are termed large-scale MPAs (LSMPAs). These areas are commonly understood to encompass at least 100,000 square kilometres, and the Ross Sea MPA would clearly qualify on that basis, given its size of 1.5 million square kilometres, with 1.12 million square kilometres of that area being classified as ‘no-take’ in the general protection zone. 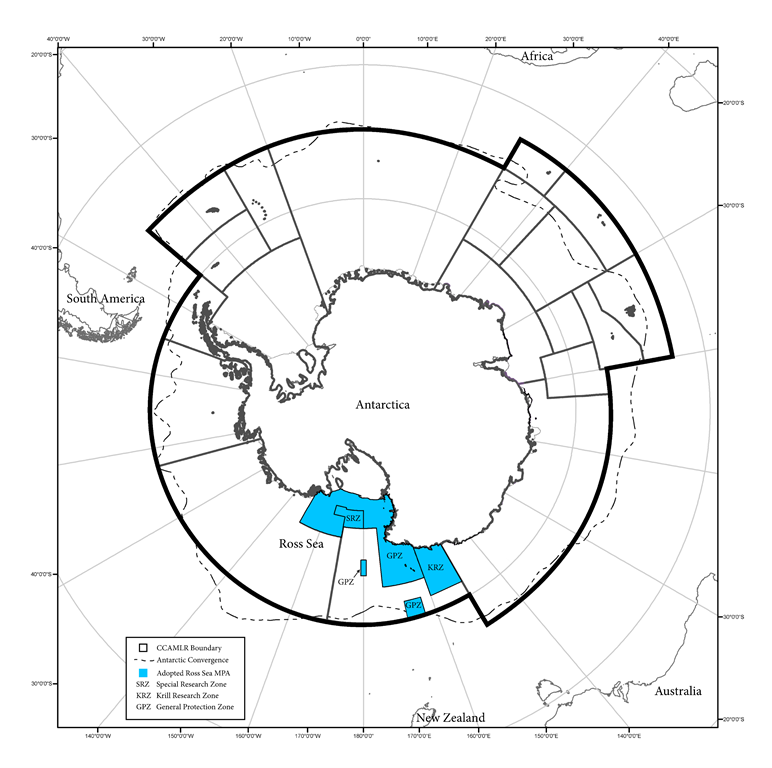 The other areas of the Ross Sea MPA are identified as a special research zone and krill research zone, where a limited amount of commercial research fishing can occur (Figure 1). Prior to the Ross Sea initiative, most of the LSMPAs were to be found in the Indian and Pacific Oceans. In terms of area, the Ross Sea MPA compares in size to the New Caledonian Coral Sea MPA (c. 1.4 million square kilometres). Figure 1. Ross Sea Marine Protected Area (MPA; in blue) adopted by the Commission for the Conservation of Antarctic Marine Living Resources (CCAMLR) in 2016, having come into force in December 2017. CCAMLR Area represented by black lined boundary. The GPZ refers to the “general protection zone” in which no commercial fishing is allowed. The SRZ refers to the “special research zone” which will be the focus of toothfish research fishing in the MPA. The KRZ refers to the “krill research zone” which will be the focus of krill research fishing in the MPA. A key driver for LSMPAs has been a global demand for stronger marine conservation and protection. The Convention for Biological Diversity (CBD 1992, entered into force 1993), as part of its Strategic Plan for Biodiversity and the Aichi Biodiversity Targets, called for 10% (even though the IUCN thought that something closer to 30% was a more ambitious target) of the world’s coastal and marine areas to be protected by 2020 (Aichi target 11). The growth of MPAs has been exponential, moving from 0.3% of the world’s marine areas being protected to nearly 6% in 2017. However, meeting the 10% goal by 2020 remains a testing proposition. Larger MPAs help considerably with this target and advocacy groups such as the Pew Charitable Trusts have been instrumental in calling for greater areas of the world’s oceans to be preserved in LSMPAs. Marine protected area design, adoption and implementation is always a challenge involving a combination of legal, political and environmental factors as conservationists, scientists and governments negotiate size, boundaries, and what activities will be banned or allowed. The sheer size of LSMPAs makes them a greater trial and potentially fraught with competing values and geopolitical visions. For coastal states, the designation of MPAs involves an assemblage of calculations about their offshore areas. Under the United Nations Law of the Sea (UNCLOS), which entered into force in 1994, coastal states are entitled to define territorial seas, exclusive economic zones and enjoy sovereign rights over adjacent continental shelves. The sovereign rights of those coastal states can, under certain legal and geological circumstances, extend beyond 350 nautical miles from the coastal baseline. For large coastal states such as the US with continental territories and scattered island chains throughout the Pacific Ocean, the area of ocean under national jurisdiction is immense. The US has MPAs of a wide variety of strictness and size throughout their national waters with the largest being the Papahānaumokuākea Marine National Monument around the Northwest Hawaiian Islands. One of the final acts of the Obama administration was to expand the size of the National Monument and extend it to the outer limit of the exclusive economic zone (EEZ) in order to ‘protect’ as much ocean space as possible. With this extension, the monument is now approximately the size of the Ross Sea MPA. President Obama lauded the move as motivated by a desire to conserve and protect the marine ecosystem. MPAs feed into a broader discourse of both maritime sovereignty and marine stewardship. In the last decade, coastal/claimant states all over the world, including those in the Southern Ocean region have pushed to designate MPAs in their current or former territorial waters. Amidst accusations of MPAs being motivated by sovereignty, proponent states argue that their decision to designate MPAs underlies their view of themselves as environmental stewards. The UK government’s promotion of the South Orkney Islands MPA was justified on such a basis rather than being linked explicitly to geopolitical design to secure long-term sovereignty interests over a disputed island chain. Outside EEZs and territorial waters, international waters are also of interest to geographically proximate coastal states as they scramble to stake their control over shared waters. It is widely recognised that legal and bio-geographical boundaries do not neatly correlate with one another. So, for example, what happens outside a coastal state’s EEZ could nonetheless have implications in terms of fish stock collapse, marine pollution, and/or industrial accident. In the Arctic Ocean, for example, five coastal states including Russia and the US, took the lead in negotiating a fisheries moratorium with extra-territorial stakeholders including China and the EU. Although the central Arctic Ocean is international waters, the so-called Arctic 5 argued that they were the leading environmental stewards for the region but whether the fisheries moratorium is for preservation’s sake or for the purposes of excluding others remains to be seen. For now, the ten parties involved have agreed on a moratorium of 16 years. Assessing the effectiveness of LSMPAs is a work in progress. For some of the largest MPAs in the Indian and Pacific Oceans, monitoring is patchy at best and dependent on the infrastructural capabilities of coastal states. Small islands states such as Kiribati have around 400,000 square kilometres of the Phoenix Island Protected Area to monitor, covering some 10% of the country’s EEZ. Multi-use LSMPAs are difficult to manage and oversee but 100% no-take arrangements are not straightforward either – as both rely on enforcement and monitoring. The challenges are even greater when there are no recognised coastal states beyond 60 degrees south and a patchwork of lower latitude Southern Ocean islands with recognised coastal states (Australia, New Zealand, the UK, France, South Africa and Norway). Who will have the incentive to bear the financial burden of enforcement, monitoring and management? The implementation of an MPA in the Antarctic context is fraught with tensions over sovereignty and access to marine resources. Commercial fishing in the Southern Ocean was a reality by the 1960s with Antarctic krill and finfish, such as marbled rock cod and ice fish, being exploited. Fishing activity was originally geographically concentrated in and around the waters of South Georgia, a UK Overseas Territory and other areas close to the biologically productive Antarctic polar front such as the South Shetland, South Orkney and Kerguelen Islands (where the warmer waters of the Atlantic, Pacific and Indian Oceans meet colder polar waters). The Southern Ocean can be ecologically defined as all the waters surrounding the Antarctic continent south of the Polar Front (also known as the Antarctic Convergence; see Figure 1). Yet, the politically defined boundary of the Southern Ocean varies: The UK identifies the Southern Ocean as extending to the 55°S parallel while Australia declares that it starts from their southern shorelines. One considerable achievement in 1980 was when ATCPs secured a Convention for the Conservation of Antarctic Marine Living Resources (CCAMLR), which changed Southern Ocean fisheries from being open access to having strict management rules. CCAMLR used the Polar Front as its definition of the Southern Ocean and not the more explicit political boundaries of the UK and Australia. CCAMLR established a Commission to help conserve marine life in the Southern Ocean. Three issues reveal well the tensions that exist between saving, securing and sustaining this maritime region. First, the Commission makes decisions based on the advice of a scientific advisory committee, and then agrees to legal management rules (e.g., gear restrictions, allowable catch) in the form of “Conservation Measures,” or CMs. At their scientific best, CMs have been widely lauded as some of the most effective in global fisheries management. Second, CCAMLR juggles both conservation and exploitation imperatives – so-called ‘rational use’ is permissible if it is sustainable. Third, signatories to CCAMLR were aware that the human history of Antarctica is punctuated with stories of over-exploitation and near-extinction of species including seals and whales. And in order to secure agreement over the future usage of the Southern Ocean, CCAMLR operates on the basis of consensus, which can lead to frustration by both conservationists and harvesters alike about the scale and pace of commercial fishing (with governments being pressured to support both groups simultaneously). Since its entry into force in 1982, CCAMLR aims to manage these tendencies. The success of CCAMLR has been mixed – conservation measures cannot immediately reverse a history of over-fishing and the development of new commercial fisheries for fish such as the Patagonian toothfish stimulated new expressions of illegal, unregulated and unreported (IUU) fishing. CCAMLR has had to respond to a coterie of challenges by introducing ever more complex measures to record, track and evaluate conservation and harvesting practices. Parties to CCAMLR do not always agree with one another about how best to advance the objectives of the Convention. It is common to hear reports of CCAMLR meetings in Hobart Australia as being divided between fishing nations such as Russia, China and Korea and more conservation-oriented nations such as the US, Australia, New Zealand and the UK. Such divisions, however, can be over-stated. The UK, Australia and New Zealand are not only claimant states in Antarctica but also coastal states of islands such as South Georgia which have an ongoing history of commercial fishing. They are also involved in commercial fisheries. The Government of South Georgia, acting as a UK overseas territory, is juggling incentives to exploit and to protect. While the UK benefits from fisheries-related revenues, it also alienates long-term counter-claimant Argentina by acting as a sovereign agent. The first MPA in the Southern Ocean was agreed south of the South Orkney Islands in 2009, and the UK as a claimant state was a visible champion of the initiative. It was the world’s first high seas MPA and secured the consent of other CCAMLR parties because it was comparatively small (94,000 square kilometres) and it did not interfere with the commercial fishing interests of countries like Russia. New Zealand, another claimant state, was an active supporter of the commercial development of fishing in the Ross Sea in the 1990s onwards. So it is too simplistic to characterise any disagreement over Southern Ocean MPA proposals as one between conservationist states and fishing states. The US has been overwhelmingly supportive of CCAMLR and is a source of some of the most active conservation-minded analyses and campaigning in favour of marine protection. Since CCAMLR’s entry into force, the US committed itself to a long-term monitoring programme but does not fish in the region. Having experienced large-scale over-fishing and species collapse in the international waters of the northern Pacific Ocean in the 1970s and 1980s, successive administrations have worked in support of CCAMLR conservation measures. The US was a supporter of the 2009 South Orkney Islands MPA and active in the campaign to secure a Ross Sea MPA. As the largest polar operator in the Antarctic, however, it is also attentive to the fact that countries such as China and South Korea are more active in polar research and commercial exploitation of Antarctic marine life than ever before. The Ross Sea MPA lays bare something fundamental about how one manages and controls international waters such as the Southern Ocean. As areas of the world which exceed the sovereign control of any one or several coastal states, their management depends in large part on states working collaboratively and consensually. For 35 years, CCAMLR has acted as a regional fisheries management organization (RFMO), working to meet conservation and harvesting agendas. Overall, commercial fishing is restricted to relatively low-levels in the Southern Ocean compared to other international waters and compared to the population size of some species (e.g., Antarctic krill). So any attempt to impose more restrictions on Southern Ocean fishing in the name of conservation, attracts some degree of suspicion and even hostility from other CCAMLR parties, eager to enable more harvesting of fish and krill. The Ross Sea is only one of the most significant marine areas in the world. As marine biologists have affirmed, it is difficult to underestimate significance. The waters are home to an array of animals and plant life including whales, penguins, seals, fish, flying sea birds, and sponges. It is also the breeding ground for the slow-growing but commercially lucrative fish, the Antarctic toothfish (the southern congener of the Patagonian toothfish; both marketed as Chilean Sea Bass). Despite an array of scientific and environmental advocacy, the Ross Sea MPA offers a textbook example of how difficult it can be to negotiate marine spatial planning. Initiated in 2012 by the US and New Zealand (an Antarctic claimant state), the Ross Sea MPA proposal was mired in controversy, first between the proponents, and then later as other parties argued with the proponents about the size and restrictions that were going to apply to any MPA designation. While designating an MPA in the Ross Sea had clear ecological value, the process of doing so became tangled in politics as CCAMLR states fought to save, secure and sustain according to their own national agendas. In 2012, New Zealand and the US brought independent competing proposals to CCAMLR. Both of the proposals had similar overarching conservation objectives: to protect the ecological structure and function of the ecosystem. However, the US, which does not engage in toothfish fishing, proposed an MPA that displaced more of the commercial Antarctic toothfish fishery than that proposed by New Zealand. The major point of contention, between the US and New Zealand proposals, was the “Special Research Zone (SRZ)” (Figure 1). The US wanted to close much of this highly productive area to provide a reference area for measuring the ecosystem impacts of the Ross Sea fishery by comparing this area with the heavy fished areas located just outside the proposed MPA. However, this area is also a prime toothfish fishing ground and New Zealand emphasized that this region was essential to maintaining the continuity and integrity of their tagging programme. It took intense after-hours work during the 2012 CCAMLR meeting and much urging from the other Commission members, but the two countries did forge a compromise and the SRZ, where a limited amount of commercial toothfish fishing would be allowed, became part of the MPA proposal. Having competing proposals between the US and New Zealand in the Ross Sea, showed tension, conflict, and competing values that then raised questions about the underlying motivations of the proposed MPAs. The US maintains the largest Antarctic scientific base in the Ross Sea, which then provides essential support for their South Pole Station (at the intersection of all the historic Antarctic claims). As such, the US maintains a vested interest in having a large presence in the Ross Sea. New Zealand, which historically claimed the Ross Sea region, had repeatedly in the past tried to exhibit control over the region, including efforts in the late 1990s and early 2000s to “protect” the Balleny Islands (in the north-western Ross Sea). Further, around the same time, New Zealand led the development of the Ross Sea fishery and even attempted to seek exclusive access to it. Neither the protection of the Balleny Islands nor control of the Ross Sea fishery was allowed, as other CCAMLR states would not agree to it. Russia drew attention to this geopolitical past during Ross Sea MPA negotiations, making accusations that the MPA was being used to reinforce sovereignty rather than for ecological purposes. This concern would be further supported by evidence that MPAs were largely being proposed by claimant States with boundaries that align with suspended territories. Over five years of intensive negotiations, the Ross Sea MPA proposal shifted in form as proponent states attempted to meet the competing values of the diverse CCAMLR member states. In 2013, large areas in the north were removed due to scientific uncertainty surrounding them. In 2014 tense relations between the US and Russia led to MPA negotiations becoming entrenched in a larger global power play. Finally, in 2015, China’ support was obtained for a Ross Sea MPA proposal, which some have directly attributed to high level political meetings between the US and China (Tang 2017). China, thus, was able to use the Antarctic for high-level diplomacy. Further, proponents added a Krill Fishing Zone (KRZ, Figure 1) to accommodate China’s desires for MPAs to better accomdate their krill fishing interests. In 2016, Russia was isolated in negotiations as being the only state not supporting the Ross Sea MPA and they finally joined the consensus after CCAMLR collectively agreed to accommodate higher levels of toothfish fishing in and outside of the MPA. A disadvantage of consensus being that the decision on each conservation measure would be weighted in favour of industrial interests… the only point that is crystal clear is that no decision making procedure can, of itself, force a state to accept a conservation measure which it deems to be contrary to its vital interests. The CCAMLR MPA process makes clear that while Southern Ocean MPAs are in the interest of some States, notably proponent States, they are in contrary to the vital interests of others due to interference with economics, power, or other factors. A challenge in consensus-based decision-making is that any one party can block a measure from moving forward; with the risk that individual State interests can undermine international cooperation. Coinciding with the entry into force of the Ross Sea MPA in December 2017, ten parties announced a fisheries moratorium for the central Arctic Ocean (CAO). Lasting some 16 years, the aim of the moratorium is to give parties an opportunity to better understand how the CAO might alter in the future, as sea ice retreats, fish stocks migrate and ocean waters alter due to acidification. The hope is that signatories such as the US, the EU and China will fund more fisheries conservation research and set up long-term monitoring programmes during the moratorium. It also represented a relative highpoint in diplomatic contact of the EU and the US with Russia, which has suffered since the Crimea/Ukraine crisis and the imposition of sanctions. While no one believes that the CAO will accommodate a commercial fishery in the near future, it is not inconceivable that in 2033 that some of those parties feel differently about the 2.8 million square kilometres involved. After 16 years, the ten parties agree that the moratorium continues to be in force, renewable every five years. What any LSMPA as well as fisheries moratoriums reveal, is that there is a delicate, and at times awkward balance between the sovereign rights of coastal states and extra-territorial parties, especially when the waters in question are international (CAO and Ross Sea). Geographically proximate coastal states acting as environmental stewards are usually viewed with suspicion by extra-territorial parties. UNCLOS declares that all parties should cooperate in regional bodies for the purpose of managing fisheries that migrate between international waters and EEZs. The purpose of MPAs and fisheries agreements such as the one pertaining to the CAO are to stake out what are the limits to commercial fishing and how best to avoid illegal, unregulated and unreported fishing. Marine science has never been more important but making sense of it is never divorced from geopolitical imperatives to save, secure and sustain seas and oceans. Professor Klaus Dodds is the Director of Research for the Department of Geography at Royal Holloway University of London. He researches in the areas of geopolitics, security and international governance of the Antarctic and the Arctic and media/popular culture. He has published many authored and edited books including Handbook on the Politics of the Antarctic, Scramble for the Poles? The Contemporary Geopolitics of the Arctic and Antarctic, Geopolitics: A Very Short Introduction, and Pink Ice: Britain and the South Atlantic Empire. Dr. Cassandra Brooks is an Assistant Professor in Environmental Studies at the University of Colorado Boulder. She draws on a diversity of disciplines including marine science, environmental policy, and science communication to study and seek solutions to pressing environmental problems. Her work contributed to the adoption of the world’s largest marine protected area in the Ross Sea, Antarctica.